MIS student, Alice Lee recently completed a professional placement internship at The University of Hong Kong Libraries. Working with a small team of librarians, she helped to conduct qualitative research on library signage and its effect on library users. Based on user experience research techniques, she worked with the team to collect data which will allow the Library to improve its signage. She writes about her internship experience for HKLA News! It is my great pleasure to have my internship at the Main Library of the University of Hong Kong (HKUL). As the last unit of the Master of Information Studies, it provided me good opportunities to put what I have learnt into practice in a real academic library. To tell the truth, I was a bit nervous but really excited when looking forward to it. The two and a half week placement flew by quickly, especially because it was so enjoyable, content and fruitful. Working with the team of librarians in the signage project allowed me to explore and get familiar with the Library in a fast and effective way. 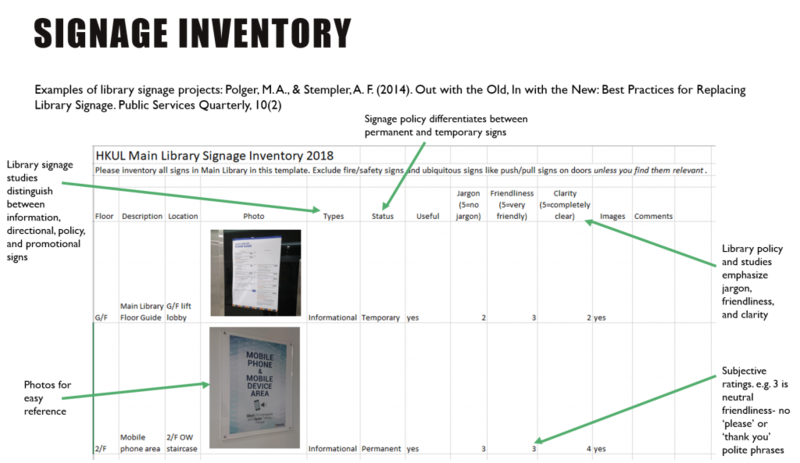 In order to improve the library signage system to facilitate wayfinding, we did an inventory of all signage and conducted two focus group sessions with volunteer student and staff participants. After detailed analysis using the quantitative data from the signage inventory and the qualitative inputs from the focus groups, I presented our findings to share updates with various departments of HKUL. Despite the fact that the project has not yet come to an end, the data collected serves a good start and reference for future work to be carried out. 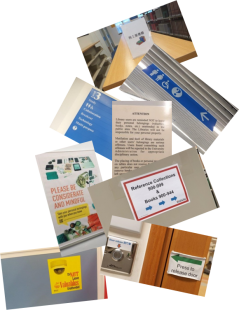 After all, good signage does not come in an easy way and quite often, its effectiveness from the patrons’ perspectives is hard to predict! While the renovation of the HKUL is still ongoing, I do hope that this signage project can contribute to the success of creating an innovative and user friendly library environment for its patrons. As for myself, during this period of time, I had quickly forgotten about my status as an intern. I felt the strong team work, openness and co-operation within the team in striving to complete the tasks on time. I am grateful for the support provided, patience and friendliness of my teammates. Lastly, I would like to wish them all the best and every success!